The name “Azure Coast” goes back to Stéphen Liégeard's book entitled La Côte d'Azur, published in 1887. At that time the southern coast of France had just been discovered by wealthy Brits who liked to spend the winter between Menton on the Italian border and Saint-Tropez. The abundance of colors and shapes attracted many painters: Renoir, Matisse, Chagall and Picasso are only the well known among them. They left behind a number of museums, which are best visited during winter, when they are less busy. 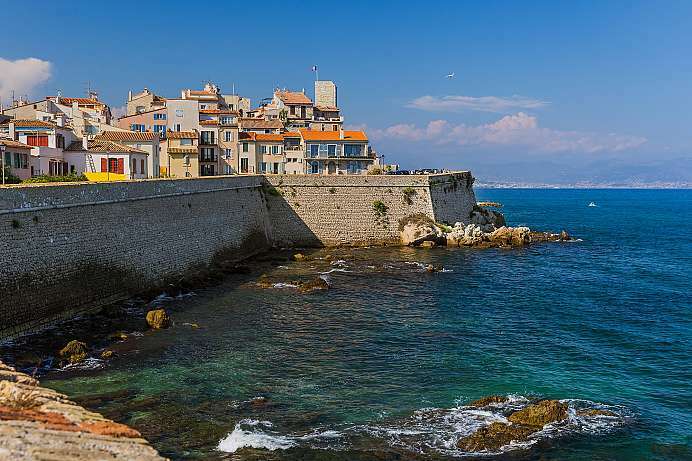 For many, the French Riviera is a holiday destination par excellence because of its sun, beach and sea combined with a picturesque hinterland and a few sophisticated cities. The port city with 75,000 inhabitants is one of the oldest on the Côte d'Azur. “Antipolis” was founded around 340 by Greek merchants and became a bishop's seat in late antiquity. The seaside resort Juan-les-Pins was opened in 1882 and has since been incorporated. At the beginning of the 20th century, writers and artists settled there, including Picasso, to whom a museum is dedicated at Château Grimaldi. Port Vauban is now one of the largest marinas in Europe, with up to 1700 luxury yachts anchoring here. The best view is from the fortress Fort Carré. The stretch of coastline near Marseille is one of the most beautiful landscapes that France has to offer. Wildly romantic coves, some of them cutting deep into the country like fjordes, are dominated by enormous, almost vertical cliffs. Inside the coves with the bottle-green water are small sailboats. Walks through the white limestone rocks will be rewarded with forever changing, breathtaking views. In summer, hiking is prohibited. Then one has to resort to a boat tour. 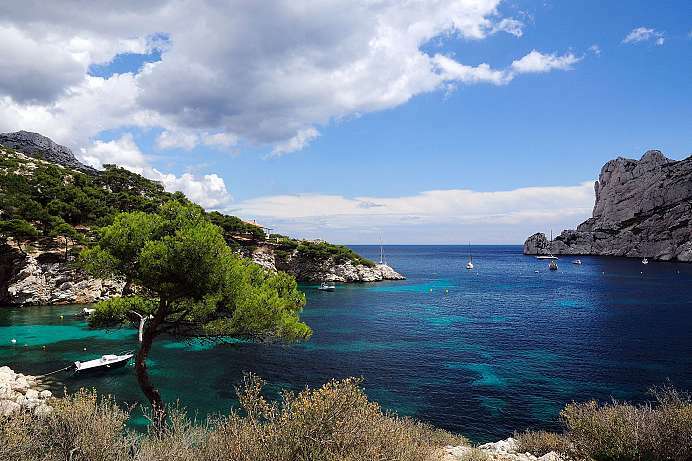 The archipelago between Marseille and the Cote d'Azur is located a few kilometers off the French coast. Because of its reddish colored rocks, the three islands are also known as the Îles d'Or – islands of gold. The largest of them, Porquerolles, is 7.5 km long and 3 km wide. Especially in the north, near the capital of the same name, one can find a few pretty beaches with crystal clear water. From there, hiking trails lead through the original macchia to a fort, a vineyard or to Sémaphore, with its 142 meters the highest mountain on the island. From there one can look far across the sea, to the other islands and to the mainland. 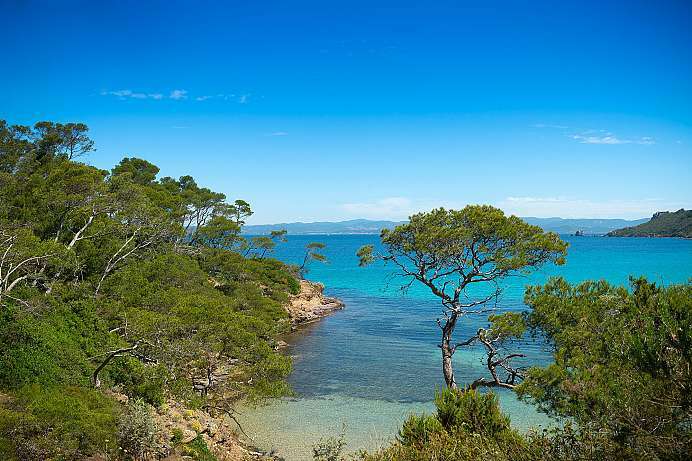 Porquerolles is easily accessible within minutes from the Giens peninsula by passenger ferry. During high season it runs every half hour. The car can be left in the car park at the ferry terminal over night. Nice is the urbane capital of the Côte d'Azur. The “Sky-Blue Coast”, as the French call the Riviera, has been a vacation paradise ever since it was discovered by British aristocrats in the 18th century. The shield provided by the Alps just north of the city makes the climate pleasant all year around and promotes the growth of a wide variety of flora. The area's main attraction, of course, are the endless beaches stretching along the coast. The fact that the 5th largest metropolis in France is just 30 km from the border to Italy becomes most apparent after sundown when the city's nightlife begins in the cobble stone streets of the Old Town. 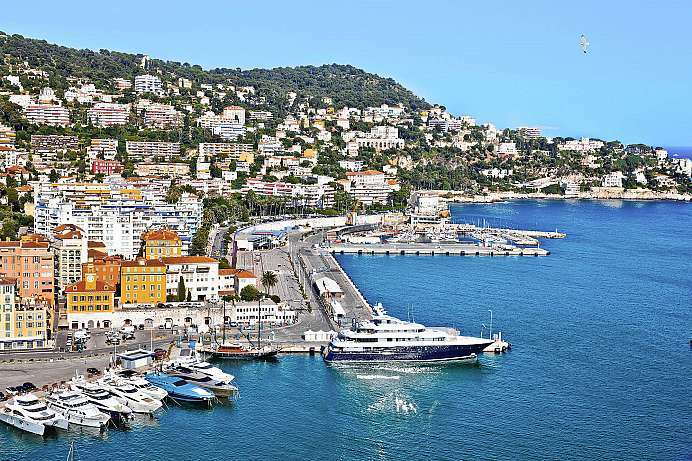 Named after an early Christian martyr, the harbor town on the Cote d'Azur was a simple fishing village until the 20th century. The boom began in the 1950s when “St Trop” became a meeting place for the rich and famous. Wealthy vacationers from all over the world spend their summers in the famous beach clubs: Tahiti Plage, Club 55 or similar. 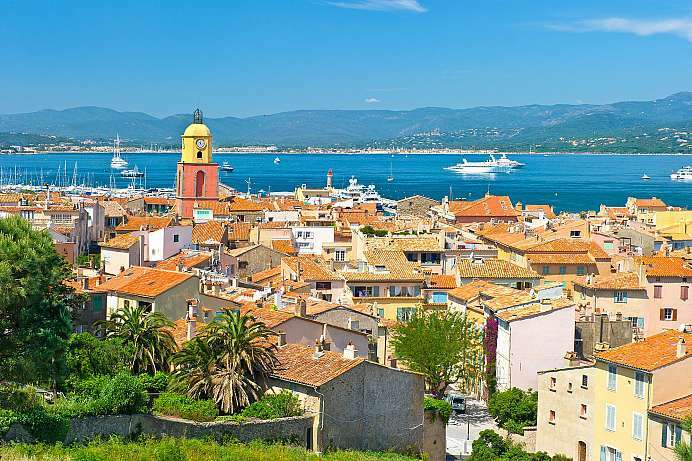 Saint Tropez is known for its exclusive marina and the Baie de Pamplonne, the longest sand beach on the Cote d'Azur. The numerous shops and gourmet restaurants are priced for their special clientele.